Day Christensen is a Level II Authorized Teacher from the K. Patthabi Jois Ashtanga Yoga Institute (KPJAYI) in Mysore, India. 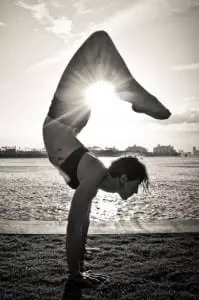 Day began her yoga practice in 2004 after receiving her BFA from the University of Illinois at Chicago. During her college years as a fine arts major, a lifelong interest in yogic philosophy began to surface. She incorporated the study of yoga with her academic pursuits. Through the reading of sacred and historical texts proved to be interesting, it was lacking one major aspect: experience. With many signs pointing her in the direction of yoga, she took up the practice and began to gain the experience she was missing from study alone. Asana required a different type of strength and mobility that she had not bargained for as a former athlete. Despite the frustration and challenges she often met on the beginning path of yoga, she continued and found a renewed sense of vitality and clarity. Today Day is an enthusiastic student of Ashtanga Yoga, practicing in lineage of Sri K. Pattabhi Jois, having completed the Intermediate series and learning the Third series under R. Sharath Jois’s guidance. Day’s teachings are born from her own disciplined and dedicated practice. She encourages students to challenge themselves physically, while, at the same time, be easy mentally. She is thrilled to share what she has learned with students in Miami and around the world. Sign-up now to keep up with all things DAY1YOGA!